Allow me to introduce myself: My name is Aleta Watson and I live to cook and eat. Northern California readers may recognize me as the food writer and restaurant critic from the San Jose Mercury News, but I recently left the rapidly shrinking world of newsprint for the seemingly limitless possibilities of the Internet. Here, I plan to explore the culinary universe, following my palate wherever it takes me. I hope you’ll come along for the ride. My primary interest is cooking. While I’m fascinated by exotic ingredients, I feel a responsibility for the planet. That means I’ll be cooking mostly with organic, seasonal produce, often from farmers markets. It’s no sacrifice since that’s almost invariably where the best fruits and vegetables are to be found. I may not be ready yet to limit myself solely to food produced within a 100 mile radius from my home, but I think it makes sense to buy locally whenever possible. My taste and curiosity are wide ranging. In the past, I’ve written about everything from figs to fava beans, from grits to souffles. Still, nothing makes me happier than a homemade cookie. Bakery cookies just can’t compete and store-bought are rarely worth the calories. 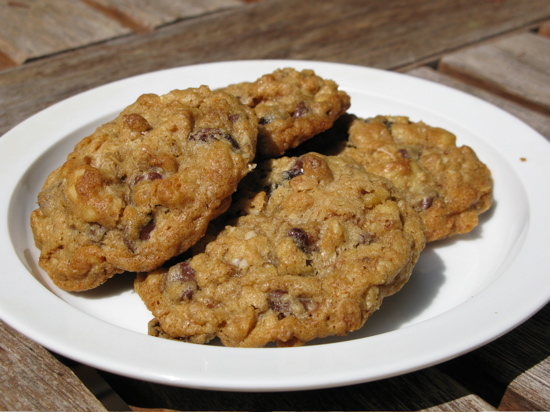 So I’m kicking this blog off with a terrific oatmeal cookie I’ve been making for family and friends for years. The basic recipe comes from Rose Levy Beranbaum’s Rose’s Christmas Cookies (William Morrow and Company, 1990). I was first drawn to Mrs. King’s Irresistibles by Rose’s story of enjoying them at the Babbling Brook Inn in Santa Cruz two days before the Loma Prieta earthquake in 1989. I live less than 10 miles away in the San Lorenzo Valley and that quake is seared in my memory. With the first bite, I knew I’d found a winner. The texture was gloriously chewy and the flavor was homey yet complex, punctuated by dark chocolate and sweet raisins. I’ve made these cookies so many times that the binding has broken and pages tumble out of the cookbook every time I open it. These are the ultimate oatmeal cookies, pumped up with granola and walnuts for extra texture. I’ve revised the recipe only slightly, substituting dried tart cherries from Trader Joe’s for the original raisins to bring a sharper edge to the flavors and lowering the oven temperature to 350 degrees for more consistent results in my stove. They’re my son’s favorites. Makes about 3 dozen 3-inch cookies. Place two oven racks in the upper and lower third of oven and preheat oven to 350 degrees. Place walnuts on a cooking sheet and bake, stirring occasionally, for about 10 minutes, until lightly browned. Cool completely. In a large bowl, toss together the cherries, granola, rolled oats, and chocolate chips. In a small bowl, place flour, baking soda, baking powder and salt and whisk to combine. Chop walnuts coarsely and fold into the flour mixture. Set both bowls aside. In the work bowl of an electric mixer, beat the brown and granulated sugars together until blended. Add butter and beat until smooth and creamy. Scrape down sides of bowl. Beat in eggs and vanilla, scraping down sides of bowl again. At low speed, add the flour mixture and beat just until incorporated. Scrape batter into the bowl containing the chocolate chip mixture and stir together until blended well. Using your hands or a scoop, shape dough into 1¾-inch diameter balls (2 level tablespoons) and place them 2 inches apart on ungreased cookie sheets. Bake for 12-15 minutes – rotating the cookie sheets from top to bottom and front to back halfway through the baking period – until tops are beginning to turn a light brown. It’s better to underbake than overbake these cookies. Cool for a few minutes on the cookie sheets until firm enough to transfer to a wire rack with a small, angled metal spatula. These cookies keep several weeks at room temperature when stored in an airtight container. They’ve never lasted that long at my house, though. They also freeze well. Adapted from “Rose’s Christmas Cookies,” by Rose Levy Beranbaum. I’m so happy to see your blog come alive! I look forward to more delicious writing. Thank you so much. You may be my first reader outside the family. Congrats on your blog. Think globally, eat well locally! Wow, Aleta, what a cool page! Terrific design and yummy recipe. I still have yet to figure out how to bake at 7,000 feet. But maybe I’ll try this recipe. Best of luck in your new venture! Hi Aleta! Another reader outside the family. Great to see you resurface. Looking forward to reading more. The site looks great! Can’t wait for more recipes and great writing. Mostly, can’t wait for you to do all the dirty work in the kitchen while we-your readers- get to enjoy the fruits of your labor. More, we want more! I agree with everything Mishel says. Great logo, too. YUMMMMMMMMM! Can’t wait to start reading your work again!! The site is gorgeous!!!! YAY!!!!!! Finding this makes my whole day! Aleta — Congrats on your fab new website! I’m sorry I missed saying goodbye on your last day, but I’m looking forward to reading you here. I just tried to make the cookies. I felt like the dough to chip, granola, nut ratio I made doesn’t look like your picture at all. I suspect it might have been the granola I used. (Standing in front of over a dozen choices in the grocery store, I was completely dumfounded. They all seemed flavored…) Can you please give me some granola tips? Also, why do you recommend a small, angled metal spatula? I don’t have one and would like to know what I’m missing before I invest. P.S. The cherries are delicious. Applause for your substitution! I usually just buy pretty generic granola in a plastic bag at Trader Joe’s — nothing too fancy. It’s really about the texture and I don’t want it to be too sweet. The original recipe called for unsweetened granola, but that’s not as easy to find. A more significant issue may have been how soft your butter was when you mixed the dough. You want it to be room temperature but not so soft it’s almost liquid. Then the cookies tend to spread when they go into the oven. If your cookies come out too flat, pop the dough in the fridge to chill a bit before proceeding. The angled spatula just makes it easier to get the cookies off the baking sheet. It’s nice, but not essential. Oh! Aleta, you made me miss you even more. The apples, the Pajaro Valley. The strawberry fields. Your site is wonderful. The photos are perfect. I am so happy for you! Wish I could come over and have dinner! Oops! Forgot to put in website.